President Obama today held an online town hall meeting in which he answered questions submitted to the White House web site. As CBS News' Chief Political Correspondent Marc Ambinder points out, the top-rated questions in the "budget" and "fiscal stability" sections of the submissions page concerned the legalization of marijuana. Hotsheet did not expect President Obama to address the pot questions during the town hall, particularly after the event opened with a pair of relatively straightforward questions. But we were wrong: the president interrupted the event midway through to address the issue. "…we took votes about which questions were going to be asked, and I think 3 million people voted or 3.5 million people voted," he said. "I have to say that there was one question that was voted on that ranked fairly high, and that was whether legalizing marijuana would improve the economy and job creation." The president then joked that "I don't know what this says about the online audience," prompting laughter from the roughly 100 people gathered in the White House East Room for the event. "…but I just want -- I don't want people to think that -- this was a fairly popular question," he continued. "We want to make sure that it was answered." And then he answered it in a way that must come as a disappointment to legalization advocates – though they could at least take solace in the fact that he did not flatly state that he opposes legalization. "The answer is, no, I don't think that is a good strategy to grow our economy," the president said. His answer prompted applause from the audience. The online town hall was something of an odd affair: It was designed to show that the president is bypassing the media in order to directly address the concerns of the American people, and yet the White House itself selected the questions – which meant that, potentially, the president could simply field a series of softballs and avoid questions he didn't like. So the president's decision to address the pot issue is commendable – after all, ignoring it would have gone against the very spirit of the event. (Though it should be noted that he didn't seem to take it very seriously.) A White House spokesman told Ambinder that the president was shown the popular online questions, but he wasn't told the specific questions that would be asked. Clearly, the president noted that the pot question was high on the list, and he decided he should address it even if questioner Jared Bernstein might have been planning to ignore it. A CBS News poll last week showed that 38 percent of Americans favor legalizing and taxing marijuana, while 58 percent want it kept illegal. UPDATE: Jack Cole, executive director of Law Enforcement Against Prohibition, emails this statement: "Despite the president's flippant comments today, the grievous harms of marijuana prohibition are no laughing matter. Certainly, the 800,000 people arrested last year on marijuana charges find nothing funny about it, nor do the millions of Americans struggling in this sluggish economy. It would be an enormous economic stimulus if we stopped wasting so much money arresting and locking people up for nonviolent drug offenses and instead brought in new tax revenue from legal sales, just as we did when ended alcohol prohibition 75 years ago during the Great Depression." More than 90,000 people submitted in excess of 104,000 questions and cast more than 3,600,000 votes for the town hall event. The White House said that 64,000 people watched it online. 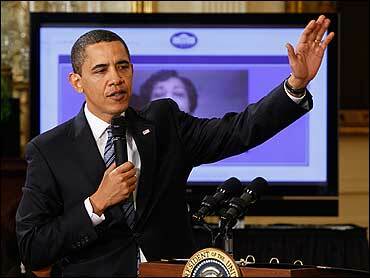 Other topics addressed by the president included education, unemployment and the mortgage crisis. He said jobs would come from investing in clean energy technologies and that it will take time before jobs are more widely available. Mr. Obama pressed for more early childhood education, and noted that the current school calendar is a holdover from a time when America was a more farm-based society. He said the educational system had to do a better job removing bad teachers from their jobs. The president also spoke kindly of nurses, noting that "it was the nurses who were there when [daughter Sasha] had to get a spinal tap and all the things that were bringing me to tears."